Happy Friendship Day To all. I remember we used to give friendship day bands to our friends in school. With Back To School Season also going on I thought why not make something which you can give make yourself and give your friend as a lovely gift. You can also make this DIY for yourself. You can use your favorite words to make Inspiring Bracelets like BLESSED, HOPE etc. Let's see how to make it!!! I am using 3 different types of Alphabet Beads; one is in black round shape, second is in white round shape and the third one is in white square shape. Step 1. Measure Elastic Cord by wrapping around your Wrist to get your bracelet size. Step 2. Cut it 2-3 inches extra than the measured size. We want extra Cord for working with it. Step 3. Secure one end of the Cord (so that beads doesn't slip) and start working on another end. You can use old Notebook and secure one end of the Cord with Clear Tape. Note:- Here I am making three Bracelets; Good Life, Blessed, and XOXO Bracelets. The process is the same for each. Step 4. For BLESSED Bracelet. Start adding Beads one by one on the cord, first add all the Alphabet Bracelet together shows as Blessed then add few Black Beads, then Gold Bead then some White Beads. Step 5. Repeat the same pattern with the Black and White Beads, till you get the bracelet according to your hand size. Step 6. Now just check by wrapping the bracelet, whether it's coming on your hand properly. If you feel there are more or less beads you can add/remove beads accordingly. Step 7. Using both the ends of the cord, make 3-4 knots to properly tie the bracelet. Tip:- You can even use little Glue to secure knot permanently. Step 8. Cut any extra cord if remaining. Bracelet is ready! Step 9. 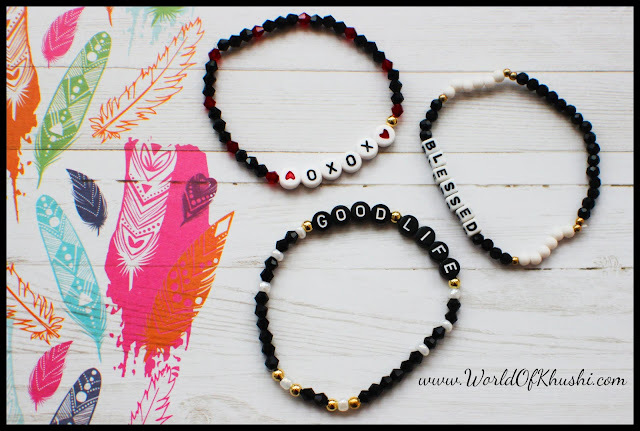 Do the same process for GOOD LIFE Bracelet for which I used Black, White, Golden and Black Alphabet Beads. Step 10. Again do the same process for XOXO Bracelet for which I used Black, Red, and White Alphabet Beads. Your beautiful Alphabet Beaded Bracelets are ready!! I like to wear all three together. Note:- You can buy Beads using this link and Elastic Cord using this link. This is the perfect Gift for your Kid' School Friendship Day Celebration. I am sure kids and their friends will love this personalized Gift. You can even throw a little party for kids at your home where they can make this easy DIY Bracelet. If you and your kids like this DIY then do share your feedback with us!! Also, share your Kid's recreation pictures with us, will post them on our website. For more such easy DIYs stay tuned with Khushi's World. Please share some love and support by liking and sharing our Posts!! Follow me on Khushi's World Facebook Page, Google+, Instagram, and Pinterest. I will see you in the next post till then take care! !